MY NAME IS NATHAN LUCIUS is by no means your typical thriller. Those who are looking for something that is a bit different but still keeps its nose firmly tucked within the crime and suspense genres will find this off-kilter offering of particular interest. This sophomore effort by Mark Winkler --- originally published in 2015 as WASTED in his native South Africa --- features an unreliable narrator who takes readers by the hand and leads them into a funhouse whose mirrors distort to deadly effect. The book is divided into three sections: “After,” “Before” and “Before and After.” The first opens with some introductory bullet points, narrated by Nathan, and gives a bit of an indication that perhaps all is not well in his world. Certainly we all know someone like Nathan. He seems to be a bit eccentric, superficial and somewhat of a loner as he goes through the motions of working at a job that he is able to perform with average competence yet with little interest. But just because we know someone does not always mean we know of him, and that is the strata that Winkler plumbs in this unsettling tale. "The twists and turns that Winkler provides make the novel addicting from its unusual beginning to its final sentence, which is a revelation all by itself. Be prepared." Nathan works in the advertising department of a struggling Cape Town, South Africa newspaper. The underlying message --- a newspaper sells not news, but ads with articles sandwiched in between --- is a subtle one, and as the newspaper industry collapses, so does its ability to sell commercials. Nathan may be an odd case, but he understands this, at one point saying the obvious out loud and eventually paying the price for it. The focus of MY NAME IS NATHAN LUCIUS is not on Nathan’s employment, but on his relationships, such as they are. The first-person present narrative gives readers an unflinching, though not totally accurate, look at Nathan’s friends, none of whom have anything in common with the other. Nathan has a superficial relationship with Eric, a local tavern owner. There is also Mrs. Du Toit, the woman who lives in the apartment next door to him, who takes him in as somewhat of a carnal pet. Then there is an older woman named Madge, who, in her own way, is even more eccentric than Nathan, with a fashion sense that almost begs description. Madge runs an antique store of dubious reputation, given that she knows next to nothing about antiques. Nathan, who has an obsessive interest in old photographs and a knowledge of other objects of antiquity, assists her in a regular, if hodgepodge, fashion. As Nathan’s story unfolds, we learn that Madge is terminally ill with cancer. She wants Nathan to end her suffering, and a part of the book is given over to their discussion as to how he will do this. What results unleashes a somewhat unexpected, but not altogether surprising, chain of events, some of which the reader becomes immediately aware and others that are only revealed in retrospect. We also gain some insight into Nathan’s background. The guy is not right in the mind, but he most certainly has a reason. The result gives us a cautionary tale about the consequences of actions and how they radiate far into the future in deeply unfortunate ways. 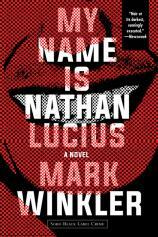 MY NAME IS NATHAN LUCIUS is a fast read, though its unblinking narrative will occasionally give one pause. Nathan is unusual, but readers may find that in their heart of hearts they share one --- or more --- of his peculiarities. The twists and turns that Winkler provides make the novel addicting from its unusual beginning to its final sentence, which is a revelation all by itself. Be prepared.